To the uneducated observer, “Big Moe” and “Sweet Sue” looked like horizontal monoliths on the floor of the production plant of the International Latex Corporation (ILC) in Dover, Delaware. The giant sewing machines were the only two that were big enough (after the additions of an elongated arm and a new sewing bed) to accommodate the bulk of a nearly-completed A7L, the company’s answer to NASA’s demand for a spacesuit that could withstand the punishing conditions of lunar exploration. The “A” was for Apollo, NASA's blanket name for the moon missions; the “7” signified the generation of suit; the “L” was for ILC and latex, some of the most crucial material in the 21 layers being stitched and glued together around the clock. Using modified versions of the same Singer sewing machines used for girdles, bras, and diaper covers, ILC—better known by their overarching consumer brand label, Playtex—was, after a successful bid on the job, charged to protect astronauts from the jagged rocks, lack of oxygen, and searing heat (and freezing cold) on the moon's surface. The women assembling the suits had been pulled from undergarment assembly lines, sometimes working in excess of 80 hours a week to make sure the suits were ready on time. A few of the seamstresses would post a picture of the astronaut whose outfit they were tailoring near their stations [PDF]. It was a reminder that the work they were doing was a different kind of support system than they were used to providing. One errant stitch could mean thousands of dollars in wasted expenses. It could also mean someone’s life. Of all the military-industrial businesses to try and seduce NASA into being awarded a contract, Playtex was by far the least likely contender. Formed in 1932 by A.N. Spanel, the garment manufacturer had found its niche in rubber and latex-sourced underwear, particularly the form-fitting girdles that had slowly overtaken corsets in the first part of the 20th century. Although most of their business stemmed from intimate apparel, Playtex maintained a small but busy Industrial Products Division that had secured contracts with the Air Force in the 1950s for pressure helmets [PDF]. They had also come close to winning a bid for high-altitude flight suits with mobile joints, as well as a contract for NASA’s Mercury and Gemini programs. When NASA began soliciting bids for their spacesuit development in 1961 following President John F. Kennedy’s public declaration of a moon visit, Playtex threw their name into the hat. At a time when the space agency was preoccupied with hard-shelled suits for lunar exploration, Playtex's premise of a “convolute,” or bellow-shaped joint, was intriguing. The flexion of the elbows, knees, wrists, ankles, and shoulders allowed a suit to maintain air pressure (3.75 pounds of oxygen per square inch) while keeping the wearer mobile enough to bend over, pick up objects, and climb ladders. NASA was impressed, but Playtex's lack of experience with industrial outfitting was worrisome. Instead, they signed with longtime military supplier Hamilton-Standard in 1962 for the suit’s hardware—like the backpack life support system that offered recirculated oxygen—and directed them to subcontract with Playtex for issues relating to fabrics. The marriage was awkward from the start. Hamilton-Standard had a regimented approach to design that more closely resembled a blueprint for a machine; Playtex, in contrast, saw the spacesuit as an extension of the human inside of it. Hamilton wanted a second, back-up pressurized bladder installed in case the first one suffered from failure. It was a practical idea, but it also severely hindered movement: In a January 1964 test in simulated lunar gravity, the wearer, lying on his back, couldn’t get up. Around the same time, Playtex took note of how a front-closing suit’s zipper could become too strained when the astronaut moved forward. When it asked Hamilton-Standard to fund exploration of a rear-entry suit, the company declined. The two accomplished relatively little between 1962 and 1965. One of the most important features, a protective outer layer that could resist micrometeoroid showers, was developed by NASA internally; Hamilton-Standard pioneered a cooling tube system to regulate body temperature. (The moon could see days as hot as 300 degrees Fahrenheit and nights as cool as -271.) Hamilton-Standard also busied itself with a self-labeled “tiger” suit that they felt addressed Playtex’s shortcomings, a side project that further fractured their working relationship. In February 1965, Hamilton-Standard made an appeal to NASA: Playtex, they argued, was a consumer brand that couldn’t work within the confines of the complex engineering the suits required. One of the project leaders, George Durney, was a former sewing machine salesman, not a scientist. They didn’t have thousands of sheets of paper documenting every inch of work performed. Bureaucracy wasn’t their strong suit. NASA agreed. That same month, Hamilton-Standard terminated Playtex. They no longer had a lane in the space race. Hamilton-Standard wasn’t faring much better on their own, though. Their suits, ineffectual and stiff, prompted NASA to hit a reset button and cancel their contract as well. In spring 1965, NASA announced that they’d be holding a second round of bids for the Apollo missions. Both Hamilton-Standard and David Clark, another industrial contractor, were invited to submit samples. Playtex was not. Len Sheperd, who had been with Playtex’s industrial arm since it first began working with NASA, made a last-minute plea to the space agency: Playtex would pay its own expenses if they were allowed to be a dark horse third entrant. NASA agreed, providing the company could deliver a suit in six weeks. To meet the July 1965 deadline, Playtex had only a skeleton crew of 12 designers and engineers free to work on the project. They worked around the clock, perfecting the bellows to allow for joint movement and incorporating NASA’s thermal cooling and protective outer shell. Some offices that held fabrics or design templates were locked up at night; supervisors picked the locks to get in. When NASA greeted two of the three bidders in Houston—Playtex wound up being two weeks late—they had devised a series of 22 tests to see how each suit responded to the simulated demands of lunar exploration. David Clark’s suit had a pressurization malfunction: the helmet blew clean off during a simulated engine cover maneuver. Hamilton-Standard, committed to the bulk, was embarrassed to see that, after a simulated walk on the moon, the suit became too wide to fit inside a capsule. Their astronaut would have been stranded in space. Playtex won the suit stand-off with ease, passing 12 of the 22 tests. NASA declared there wasn’t a second-place finisher. This time, it would be Hamilton-Standard playing a supporting role, supplying their backpacks for Playtex to incorporate. Work began in both Dover and at a new facility in Frederica, Delaware on the flight suits, which combined Playtex’s focus on flexibility with the specifications for safety provided by NASA. More seamstresses were added to the growing department, adapting their ability to a different atmosphere entirely. The suits had to be perfect every time out, despite some workers having to stitch “blind” owing to the multiple layers. The women were dissuaded from using pins—it could puncture the latex bladder—but those that insisted were given color-coded tips so managers could track them. After a rogue pin was discovered in a suit, they were regularly X-rayed to make sure it didn’t happen again. And if the seamstress brought in her own pins, the guilty party had it poked into her rear end by a disgruntled supervisor. Double-shift workweeks were common. One seamstress, Eleanor Foraker, had two nervous breakdowns. While the suits were tested and re-tested, a missed detail or malfunction would cause death in less than 30 seconds. The gloves needed to be nimble enough to pick up a dime while sturdy enough to maintain pressure. A woven steel fabric was used for gauntlets to secure them to the suits. 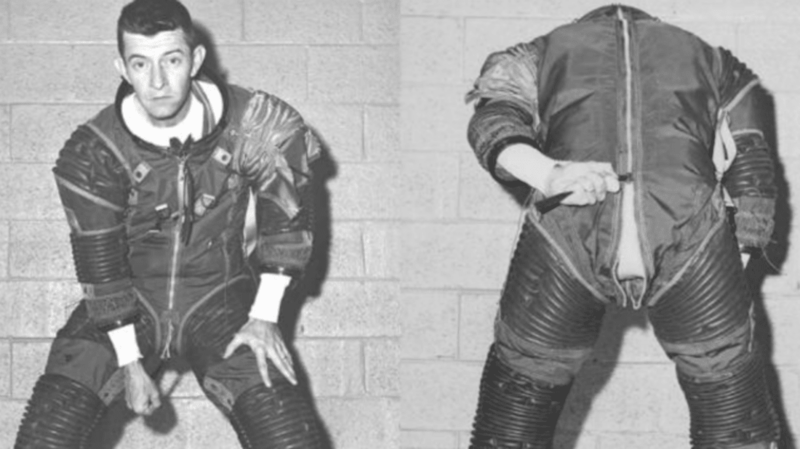 Although Playtex had an agreement for the Apollo mission suits locked in place, they decided to secure a future opportunity: a suit that could be used for extended lunar exploration. In 1968, they filmed tests with their A7LB prototype, an air-filled suit that kept its wearer nimble enough to play football in an open field. NASA bought that one, too. But the design of the suits had a goalpost that kept moving. After Apollo 1 caught fire on a launch pad in January 1967, killing three astronauts, Playtex went in search of a fire-retardant material that could help resist flames long enough for the wearer to make a clean break from a blaze. They found a woven fiberglass material coated with Teflon, resistant to 1200 degrees Fahrenheit. Although Playtex began shipping the A7L suits in 1966, their real test didn’t come until July 1969. That was when the company—along with 528 million television viewers—would see how they stood up to man’s first moonwalk. Durney, Sheperd, and a Playtex industrial team that had grown into the hundreds watched nervously as Neil Armstrong sunk his boot into the surface of the moon on July 20, 1969. They had planned for every possible contingency—Armstrong stepping on a sharp rock, or sinking into the loose ground. One micrometeoroid shower or accident could mean death. When Armstrong appeared to stumble, they gasped. But he didn’t fall. Armstrong and Buzz Aldrin spent two and a half hours on the moon collecting samples, returning to dock with astronaut Michael Collins on the command module Columbia. The suits painstakingly crafted on standard Singer sewing machines had stood up to the rigors of space travel. “It was rough, reliable, and almost cuddly,” Armstrong later said of the suit. Playtex would go on to split into separate entities, one for consumer manufacturing and one for industrial goods, ILC Dover, where they have continued making shuttle suits over the next five decades up to the present day. After use, all of the suits were immediately shuttled to the Smithsonian’s storage facility in Suitland, Maryland. In the case of the earliest lunar couture, they still have a Playtex seamstress’s final touch: their name written inside of the suit. Additional Sources: Spacesuit: Fashioning Apollo; Moon Machines.